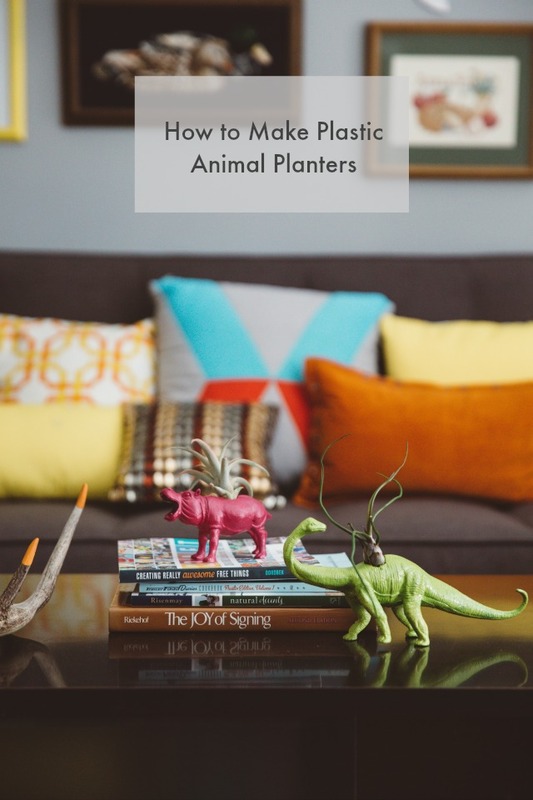 How to Make an Upcycled Animal Planter with Tom's of Maine - C.R.A.F.T. April is Earth Month, and y’all know how I feel about creating with freebies and saving our planet one small task at a time! So, I was thrilled when Tom’s of Maine asked me to partner with them and take the #LessWasteChallenge. By taking the Less Waste Challenge, I committed to reducing 1 lb. of waste a week to help our kids’ future. Part of my challenge was to come up with a way to give old or broken toys a new life. 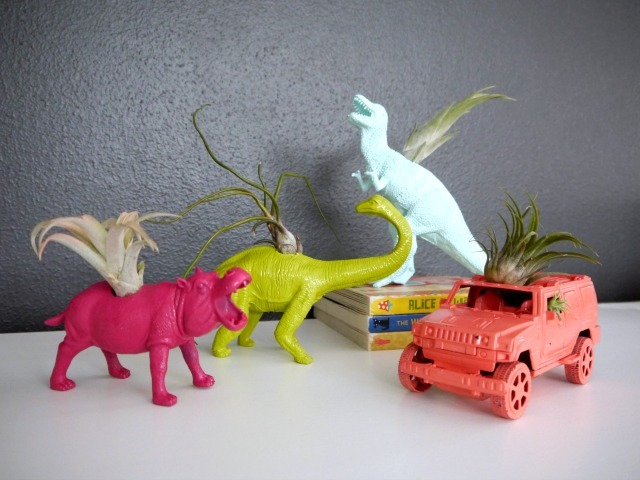 I decided to give a broken toy jeep and a few worn out plastic animals a new life as planters. If you have kids, you have a ridiculous amount of plastic toys laying around. Earth Month is a great opportunity to talk to kids about reducing waste. One way to reduce waste is to turn something that would typically get thrown in the trash into a something new. For instance, broken plastic jeep car got crafted into a new planter! Plastic animals also work great. These planters make great gifts too. Mother’s Day? Father’s Day? 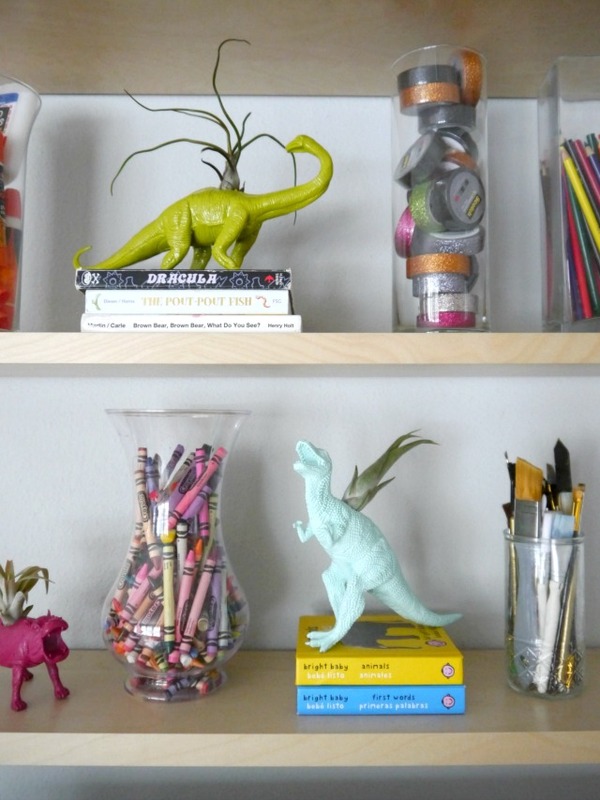 Dad would love a dino planter on his desk at work! 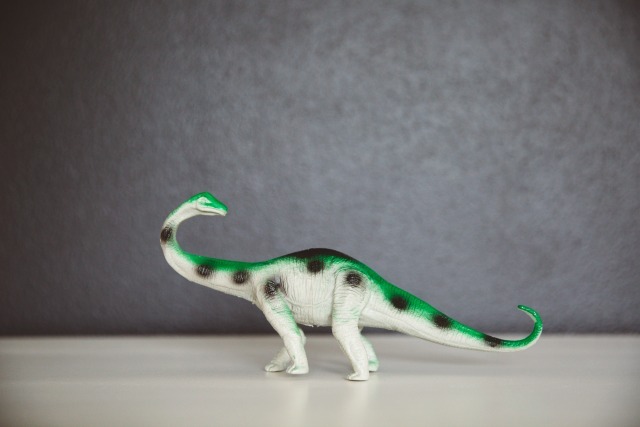 Here’s the dino before his makeover. First, grab a drill and a paddle bit. Paddle drill bits can also be called spade spade bits. If you don’t own a drill, you can use an XACTO knife to cut the whole in the plastic animal. 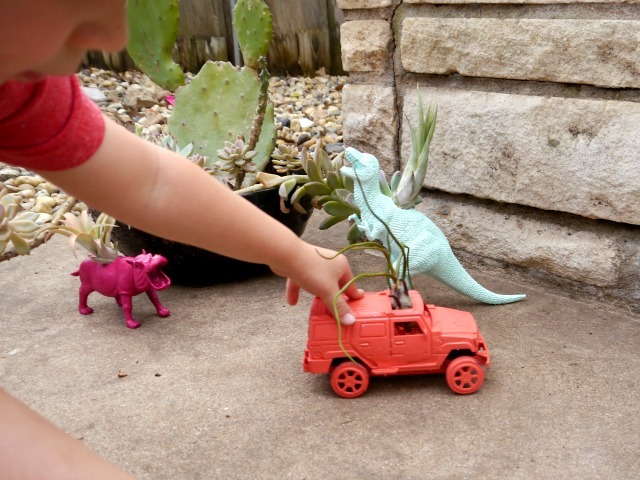 Or if you are using a plastic toy that already has a nice spot for an air plant (like the jeep), you can skip this step. After the hole is drilled or cut, it’s time to spray paint! 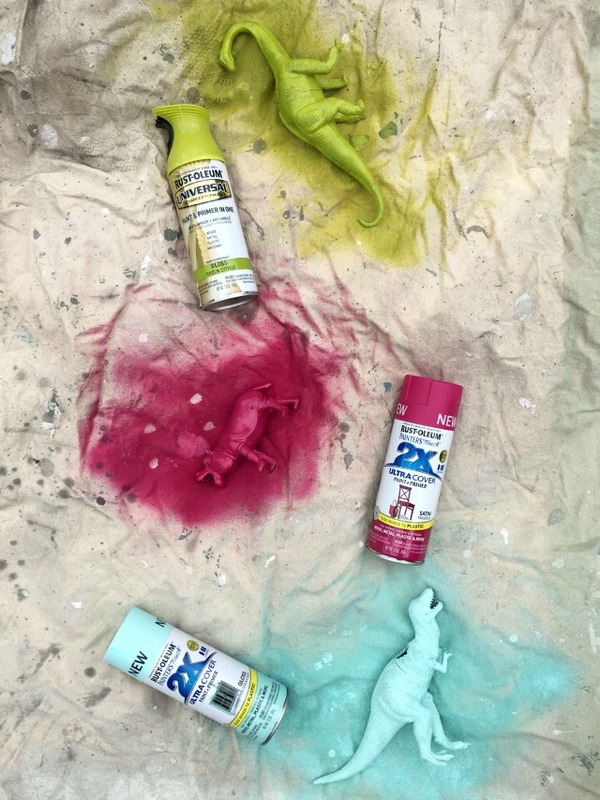 I used 4 different colors of spray paint, but one of the fun parts of this project is that you can use any color! I used Rustoleum Green Citrus, Coral, Ocean Mist, and Magenta. The finish is up to you, I used a gloss and a satin finish only because these are the colors I had on hand. 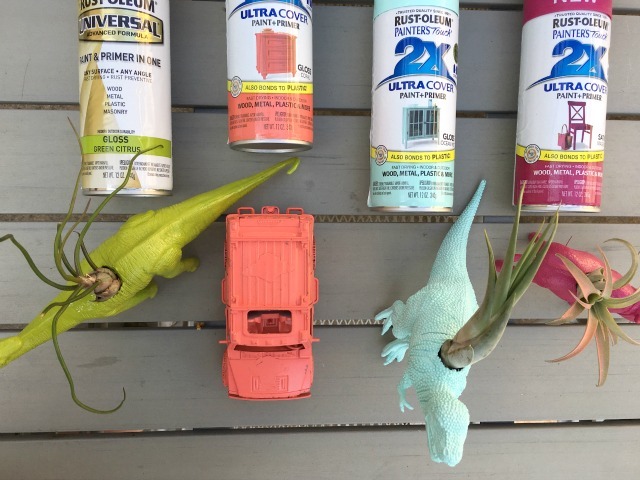 Grab a big drop or any cardboard box and spray paint your creatures the color of choice outside. I gave mine a few coats. The spray paint dries quickly, so you can likely complete this part of the project in a couple of hours. Once the spray paint dries, your planters are ready to be planted! I suggest using air plants. They are easy to take care of and come in a variety of shapes and sizes. Plus anyone can keep an air plant alive! 1. Can air plants live outside? Absolutely! Just remember air plants need bright, indirect sunlight, and they like warmer temperatures. So, bring air plants inside if it’s really chilly outside. Really chilly to this Texas girl is below 50 degrees! 2. How do I water my air plants? I mist my air plants with a spray bottle 3-4 times a week. About twice a month, I soak them all in a bowl of water for 20- 30 minutes. After the bath, pat the plant dry before putting it back in its container. 3. Where do you buy air plants? I buy my air plants at a local succulent store called East Austin Succulent. Big shocker, but Maxwell’s favorite planter is the jeep! These planters make great gifts too. Mother’s Day? Father’s Day? 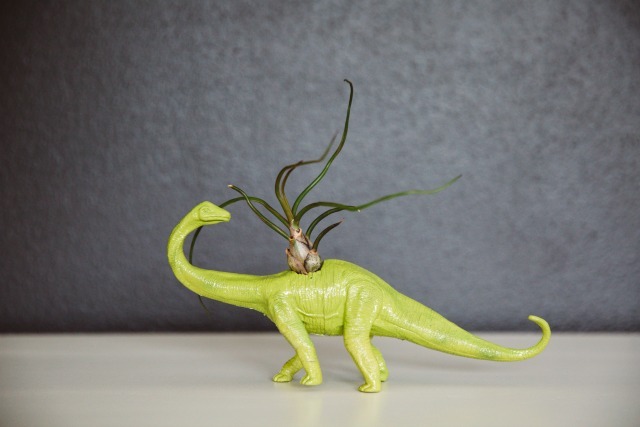 Dad would love a dino planter on his desk at work! I’d love to hear more ideas for up-cycling old toys! It doesn’t get much easier to recycle toys than that! This is a sponsored tutorial written by me on behalf of Tom’s of Maine. The opinions and text are all mine. How fun is that plastic animal. Great tutorial pictures and video! I have wanted to make a tote plastic animal now. Thank you very much for that.